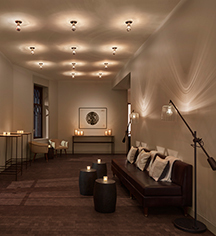 With its central and convenient NoMad location, The Redbury New York is the ideal destination in New York City for a meeting, gala, wedding, or special event. The hotel offers state-of-the-art audiovisual technology and over 7,000 square feet of indoor and outdoor meeting, event, and private dining space. The multi-functional 2,700 sq ft Gallery on the second floor features Juliet balconies and large dramatic windows. For weddings and galas, the Gallery can accommodate 140 seated banquet or 250 reception guests. 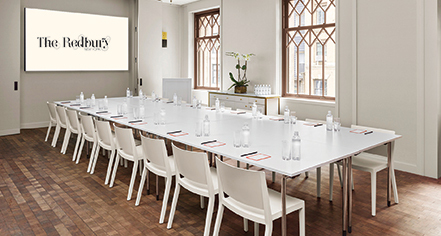 For smaller meetings or events, the Gallery can be converted into two or four modular spaces, perfect for retreats, seminars, and conferences. Connected to the Gallery and a 625 sq ft Living Room is a scenic 1,100 square foot outdoor Terrace. The Terrace can accommodate 40 seated banquet or 77 reception guests. Marta, the signature restaurant, can host elegant dining events. The main dining room can accommodate 130 seated or 200 reception guests. Overlooking the main dining room is the semi-private Mezzanine, which accommodates 26 seated or 40 reception guests. Bar Marta’s lobby lounge accommodates 100 seated or 130 reception guests. For an intimate dinner, the private dining room seats 18 guests and has built in audiovisual capabilities. Dining options are delicious and creative as The Redbury has partnered with Danny Meyers’ renowned Union Square Hospitality Group to offer in-house catering and custom-menu packages from Marta. An all-Italian wine list with local and Italian craft beers, seasonal cocktails, and a wide selection of Champagne can be provided to complete the event.